In Solidarity with the Women's March on Washington, NAMEN has joined the 10 actions in 100 days initiative. Members of NAMEN will be encouraged to a new action every 10 days during the next 100, coinciding with the new US presidential administration's first 100 days in office. Community of Practice (CoP) Teleconference Recording is now Posted! The recording for our Community of Practice Teleconference held on October 20th is now posted to the information page. Community of Practice Teleconferences are a membership benefit of NAMEN. 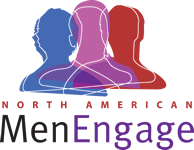 The North America MenEngage Network (NAMEN) is seeking nominations for new Steering Committee members. This year’s election will focus specifically on increasing gender diversity on the NAMEN Steering Committee. To this end, we are restricting nominations to women and female identified people. Steering Committee members are elected by the general membership of NAMEN and serve for a three-year term. If you are not currently a member of NAMEN, we encourage you to learn more about us and fill out a membership form here. Once you are a member you are eligible to nominate, vote for and serve on the Steering Committee. All nominations must be received by September 15, 2016. Nominees will be vetted and a proposed slate of candidates selected by the Steering Committee by October 15, 2016. General membership will then vote to approve new Steering Committee members. Every effort will be made to ensure that the membership of the Steering Committee represents diversity of race/ethnicity, gender, sexual orientation, age, geographical location and fields of engaging men and boys. Thank you for being a member of NAMEN! Webinar Recording is now Posted! The recording for our third webinar held on November 9th is now posted to the webinar information page. NAMEN plans to annual webinars on a range of topics related to engaging men in gender equity efforts. Visit this page often for updated information about our webinar series! Future topics include men’s engagement work in Native American, First Nation and Indigenous communities, and engaging men through fatherhood. This webinar will continue the important on-going conversation about accountability within men’s gender equity movements and organizations, and will address accountability from the perspective of those to whom we hope to be accountable, including women and women’s organizations. Collectively, panelists will help the webinar audience to define accountability in both philosophical and concrete behavioral terms, and will provide examples of how accountability has been conceptualized and implemented in their networks. The recording for our second webinar held on December 2nd is now posted to the webinar information page. "Conceptualizing and Implementing Accountability in Men’s Gender Equity Efforts"
NAMEN plans to host tri-annual webinars on a range of topics related to engaging men in gender equity efforts. Visit this page often for updated information about our webinar series! Future topics include men’s engagement work in Native American, First Nation and Indigenous communities, and engaging men through fatherhood. This webinar will initiate an on-going conversation about accountability within men’s gender equity movements and organizations, and will address accountability from the perspective of those to whom we hope to be accountable, including women and women’s organizations. Collectively, panelists will help the webinar audience to define accountability in both philosophical and concrete behavioral terms, and will provide examples of how accountability has been conceptualized and implemented in their networks. The recording for our first webinar held on June 12th, 2014 is now posted to the webinar information page. The North American MenEngage Network (NAMEN) is pleased to sponsor and present a webinar, June 12th at 1:00 pm EST, on engaging men in state and regional networks for the purpose of promoting safe and healthy communities. This webinar will bring together a diverse panel of national and province network organizers to explore the formation of men's action networks in the United States and Canada; examine the challenges in organizing and sustaining meaningful participation from its members; explore the various activities and initiatives utilized by men's networks to raise awareness and prevent men's violence against women; and discuss issues of accountability inherent in multi-gender partnerships. We hope you join us on June 12th.